Why Should I Invest in Insulated Glass Windows? Insulated glass is two or more panes of glass with air or gas between them. The main purpose of installing insulated glass windows is to prevent heat loss. However, there are many advantages of installing insulated glass windows, and luckily the benefits can be seen right away. Insulated glass windows can reduce noise levels by up to 75%. This is because they are made up of two different pieces of glass with air in between. The double layer creates a noise barrier, and can reduce even more if gas is added in between. Insulated glass windows are extremely beneficial for homes in the city or busy urban areas. With airtight, insulated window panes, up to 84% of sun’s ultraviolet rays can be blocked. This will help minimize heat transfer through the window, reducing heating and cooling costs. It’s also a very environmentally friendly window because it reduces the consumption of fossil fuel. Insulated glass windows can be installed in any type of window frame. We can replace old window panes with energy efficient ones, without having to replace the entire window, saving you time and money! 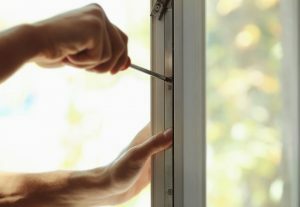 Insulated glass windows are harder to break than single pane windows, which can increase the security of a home. They also block UV rays, preventing fading of fabrics such as couches, paintings and rugs, making them last longer!